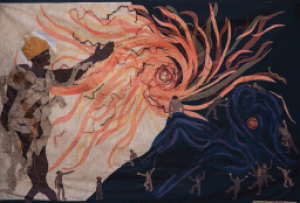 A collaborative painting from Aboriginal Yamaji Artists from Western Australia and a collaborative quilt from South African indigenous artists exposed at the Shared Sky exhibition. Left: © 2014 Yamaji Art Centre. Right: © 2014 Bethesda Foundation. All rights reserved. It reflects the richness of the artist’s ancestor’s understanding of the world developed across countless generations observing the movements of the night sky. Shared Sky explores how this sophisticated understanding of celestial mechanics resonates in the work of living artists that are sharing their insights with scientists working to unlock the secrets of the Universe. Understanding what sustains the rhythms and patterns of the world around us continues to be one of humankind’s most enduring fascinations. The movement of objects across the night sky has been a profound source of inspiration for artists since time immemorial. The desire to understand has informed creation myths and stories amongst human populations across the globe for countless generations. It is what has inspired both groups of artists in this exhibition, and what drives the large international teams of scientists and engineers developing one of the world’s greatest scientific endeavours in Australia and South Africa: the SKA radio telescope project. 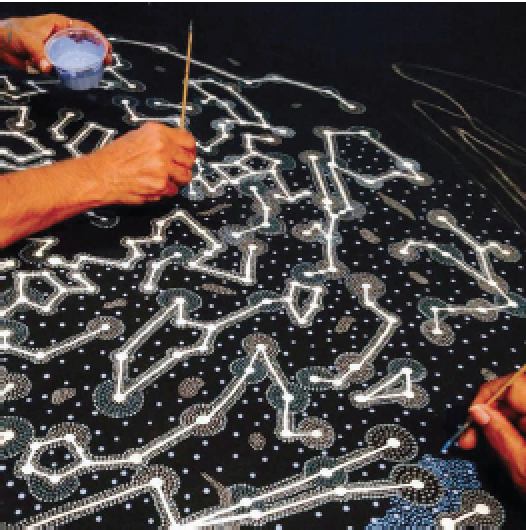 Shared Sky connects indigenous artists working in remote communities from either side of the Indian Ocean that have ancient cultural connections to the two sites where the SKA will be located. 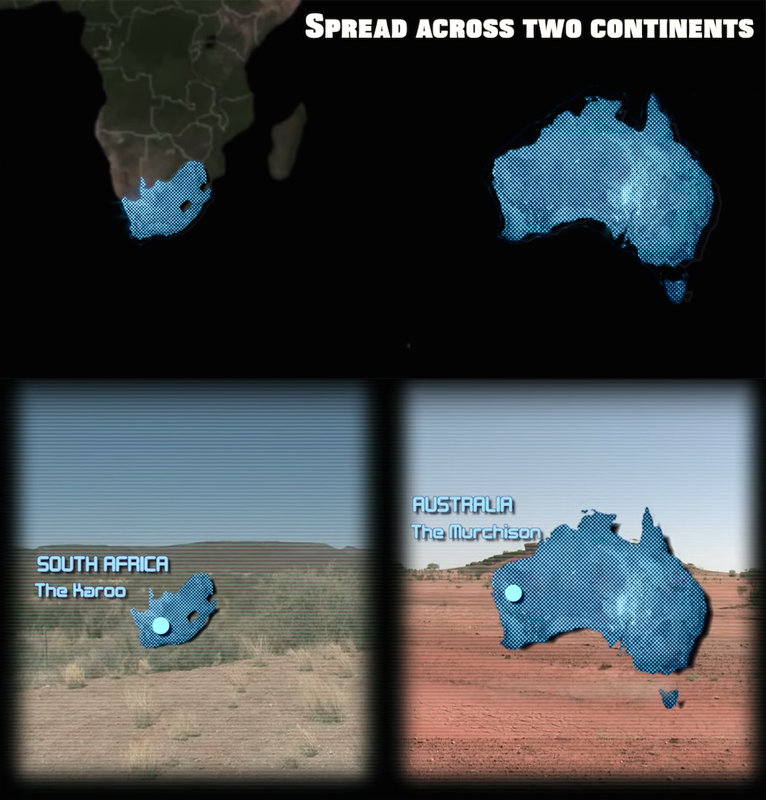 Being located on similar latitudes on both continents, the two sites in Australia and South Africa present essentially identical views of the night sky to the peoples that have lived there for tens of thousands of years, and to whom some of the oldest known artwork on earth can be attributed. Shared Sky reflects the SKA’s One Sky concept – that no borders exist in the sky and that the night sky is an increasingly scarce natural resource that belongs to and is shared by all humanity. Australian Aboriginal collaborative work being developed for Shared Sky. © 2014 Yamaji Art Centre. All rights reserved. For Yamaji people – indeed many Aboriginal communities right across southern Australia –the appearance of the dark shape of an emu stretched out along the length of the Milky Way has heralded the season for collecting emu eggs for thousands of years. In Western Australia, the Yamaji and other Aboriginal artists who have created artworks for Shared Sky are descendants of, or connected to, Wajarri people that until the mid-19th century were still living a largely traditional way of life, hunting and gathering on the land that is now the site of the Australian SKA. Many of the artists have visited the Australian SKA site and have spent time talking with scientists on site, under the stars, sharing their stories about the night sky. South African work of art exhibited for Shared Sky. © 2014 Bethesda Foundation. All rights reserved. In South Africa, artists that are descendants of /Xam speaking San people and others of the central Karoo produce collaborative artworks in textiles that explore their own creation myths and celebrate the ancient culture of their ancestors that survived in the harsh environment of the central Karoo desert region for millennia. These large art quilts reflect a visual language that stretches back to a time of great antiquity. Although the /Xam language became extinct towards the end of the 19th century. The story-telling traditions of these artists’ forbears has survived through an extraordinary collection of stories comprising verbatim interviewed accounts of hundreds of traditional /Xam stories translated into English. Shared Sky presents an unprecedented opportunity for these peoples, who share so much through their common colonial histories, to reflect upon the countless generations of proud custodianship of their respective homelands and draw strength and inspiration from each other. That these communities developed such rich and distinctive cultures over thousands of generations in absolute isolation – and an entire Indian Ocean apart – yet share so many deep concerns for the preservation of their cultural heritage, is fitting testament to the power of collaboration. Stories passed on through meticulous oral traditions from one generation to another across the millennia, and the profoundly complex understandings of celestial mechanics common to both cultures, has been brought together in this way through the cultural agency of the Square Kilometre Array project and the willingness of scientists to reach out and appreciate alternative ways of seeing. Shared Sky is presented by the international Square Kilometre Array (SKA) project and sponsored by the SKA Organisation, SKA South Africa and SKA Australia. All images of artwork associated with the Shared Sky exhibition are copyrighted and may not be reproduced without written permission. If you wish to use any images please email William Garnier, SKA Director of Communications, at w.garnier@skatelescope.org.